Zenair's STOL CH 701 aircraft continues to gain recognition around the world as a low-cost light-utility aircraft. 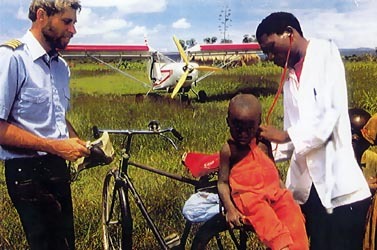 Nicknamed the "Skyjeep" by African missionaries, the popular kit aircraft is earning its keep by transporting personnel and medical supplies to remote African villages. Bill Norton, who operates a STOL CH 701 aircraft for the Kibidula Farm Institute in Tanzania, East Africa, explains, "The STOL costs less than half the amount a Landcruiser would to cover the same distance. A typical trip that takes three to four hours by jeep takes me 10 to 15 minutes with the Sky Jeep. Talk about productive use of our limited resources." In response to demand for extreme rough-field capabilities, Zenair has developed a new All-Terrain Gear (ATG) for the STOL CH 70 1. The new gear utilizes a single, heavy-duty aluminum-alloy spring for the main gear. The single carry-through gear provides increased shock absorption with double-cantilever deflection and is equipped with large "balloon" tires and hydraulic disc brakes. Norton's STOL CH 701 is equipped with an 80 hp Rotax 912 and the new ATG. He built the aircraft himself from a kit in nine months. The Kibidula Farm Institute has since taken delivery of a Zenair Zodiac CH 601 kit. NOTE: This article represents the viewpoints of the author, and not necessarily those of Zenith Aircraft Company.